We specialise in drawing up proposals for cycling and walking projects which would make a real difference to local people. We prepare the proposals and take them forward by completing negotiations for each route, including all land matters, and by securing planning consents and other formal agreements and licences. We work with numerous local authorities, local campaigns and special interest groups. John Grimshaw has been developing traffic free paths since 1979 when work started on the 24km Bristol and Bath Railway Path. 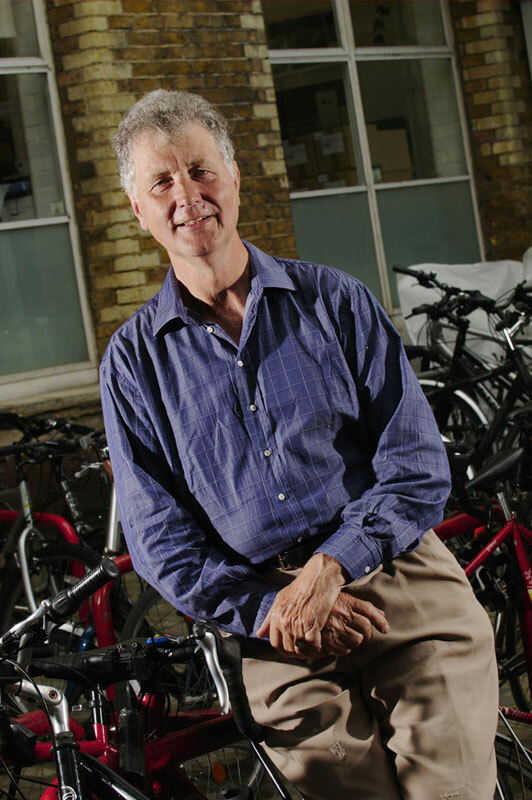 In 1984 he founded Sustrans and went on to coordinate the creation of the National Cycle Network and secure major Lottery Awards for opening the first 2500 miles of the Network (1995) and for the Connect 2 Project (2008). Since standing down as Sustrans Chief Executive, John has focussed on route development with a special interest in long sought routes which have proved intractable in the past. All the studies in the world are only of use if they bear fruit in the shape of completed cycling and greenway routes together with an enhanced environment to facilitate more walking and cycling. So the opening of the Brean Down Way from Weston-Super-Mare was a particular pleasure on July 7th last year as were the first automatic counts of 27,000 trips in the first 7 weeks of use over the River Axe sluices. There is now a popular demand to extend southwards avoiding the Coast Road to Burnham and Highbridge and negotiations for land and funds are well in hand with a view to a possible start on site this autumn. The Strawberry Line Association are patiently pursuing their dreams of linking Cheddar to Wells and Shepton Mallet where a planning application is in process. At Cambridge the County Council’s contractors have commenced work on the Chisholm Trail with a view to it being opened in 2019. Land negotiations have been complex here, and the existence of the independent Charity Greenways and Cycleroutes Limited proved invaluable in concluding agreements over a former branch line where we inherited an ongoing Licence with responsibilities for managing a (non-existent) railway which proved troublesome to the Council. Work is expected to start on site in spring 2018 with a view to completing this 4km long greenway linking Aylesbury Vale Parkway Station to Waddesdon Manor by July this year, when the contractor led project will culminate in Greenways’ annual volunteer workcamp. Following our detailed proposals for a cycling route from London to Leeds and Manchester linking all the nearby towns and villages with a high-quality cycling route, we have prepared County by County schedules of existing and potential interfaces between HS2 and Cycling routes. With HS2 now in the detailed design stage it is essential that cognisance is taken of the ways on which HS2 could foster popular cycling or sever routes forever. Some key details were negotiated by local authorities and provided for in the HS2 Bill, but many others were not. We are working with the Council and the Parishes through Buckinghamshire to endeavour to resolve opportunities in this County at least. The full schedule of route appendices from London to Leeds and Manchester have been released to Highway Authorities along the route. This is a fascinating urban route connecting Cambridge Station with the planned North Cambridge Station and linking the busway cycle route from Addenbrookes and Trumpington with the St.Ives route. The Project relies upon the support of Network Rail and other landowners and includes the new Chesterton Bridge over the River Cam and the Leper Chapel underpass crossing the Newmarket Road. Our responsibility is to provide a flexible, pragmatic support to the Cambridgeshire County Council Project delivery team. Working with Royal Haskoning DHV and Phil Jones Associates, the detailed route studies for this legacy route from London to Birmingham, Leeds and Manchester are now complete. Our surveys included assessing well over 2000 kms of options on the ground, including covering routes which might be associated with HS3 from Liverpool to Leeds, and a network of routes connecting into the Peak District from both arms of the HS2 route. Our brief was to propose works to the highest European standard (Dutch CROW Guidelines) and to pass through the centre of towns and communities within a corridor approximately 3 miles wide either side of the Rail Route. The outcome would be a large series of local routes, each of real benefit to communities otherwise bypassed by the High Speed Rail proposals, all to a flagship standard with the additional benefit that by linking up these fragments, local communities would have access to their countryside and nearby settlements, whilst visitors and tourists would have the possibility of longer national routes. The study also included a certain amount of more detailed work on potential schemes for an early delivery, such as the 5km route from Aylesbury Vale Parkway Station to Waddesdon which provides the only practical opportunity for a safe and attractive route north from the Town. In early 2015, working with David Gray, we prepared a report for the Parish Council to create a new route from the Village to give residents access to a network of quiet roads. At present the village is effectively isolated by the A59 and B6265 main roads although an existing crossing of the main York Road does provide a quiet link to Kirk Hammerton and its Station. We have supported the initiative of the local group in recovering the river Eden Viaduct of the Waverley Line by preparing a brief report on the access link essential for the project. David Gray has then continued the work through negotiations with the key landowners. This is an example of a valuable local link which has been long sought but frustratingly unobtainable. At North Somerset Council’s initiative, we have carried out detailed negotiations with all parties and planning consent for the Sedgemoor side was secured in January 2015. This year preparatory work will take place through the summer in anticipation of the sections adjacent to the Weston Road being put in place once traffic levels die back at the end of the tourist season. Some of the works will be carried out during a week long volunteer “camp” starting June 6th 2016. This will be 21 years since the launch of the National Cycle Network in 1995. In 2015 “Greenways and Cycleroutes Ltd” was set up to support the assembly of lands required for good cycling routes. There are a number of situations where it is difficult for local authorities to complete the negotiations for lands along cycle routes. These include: those parts of a single route which lie in another local authority area (Greenways is taking up the leases for the Somerset section of the Brean and Weston route); routes being promoted by local campaigns and interest groups; and situations where the Council’s legal procedures are unduly protracted. Greenways is setup under the Cooperative rules for an association in order to enable local supporters and shareholders to identify and manage their own local route. This project is wholly supported locally, and by landowners and local councils. However it has not been seen as a priority by Historic England concerned about the Grade II listed Parkland which it skirts. It is hoped that enough has now been done to satisfy this body to enable the project to proceed to planning and construction. The three Councils, South Gloucestershire, BANES, and Bristol City have come together to deliver a high quality 6km long walking and cycling route along the riverside from Keynsham Town Centre to Bristol. We are supporting them with project documents, land negotiations, securing Planning Consents and Environment Agency Licenses. Initial reconstruction work, including taking back the boundaries to create more space were completed by summer 2014. Negotiations for a new route through the woods at Conham are in hand and the works needed to bypass this busy section of road have planning consent. And further towards the centre of Bristol the Council has put in hand making a 3m wide shared use path the full length of the Feeder (2kms). We are continuing to evolve the Promenade Proposals which collect together all the initiatives and interventions which are needed to make the quays and riversides of Bristol wholly accessible to pedestrians and cyclists. A number of the proposals are currently in hand through the Temple Meads Enterprise Zone, others with LSTF moneys and yet more with the City’s successful Cycling Ambition Fund Bid. Bristol’s selection as Europe’s Green Capital 2015 helped enhance Bristol’s existing excellent reputation as a place to live and work. The challenge for Bristol is to make the most of this opportunity and to build on the City’s reputation for creativity and innovation. Portway Sunday Park is a project to promote our Green Capital ambitions and engage the community. The project is organized by a small local group who managed five Sunday closures in 2015. See the website for 2016 closures. Both these rivers entail lengthy detours inland on unsuitable roads, and they are the last significant barriers to completing the Coastal Path in this area. We are responsible for the preparation of project proposals and for using these to work out detailed solutions with each of the landowners controlling access to these existing sluice gates with their works road crossings of the rivers. In each case there are complex matters to resolve with the Environment Agency and a wide number of interests to take account of when submitting planning applications. This project has been delayed while the Environment Agency carry out extensive flood bank raising works but it is anticipated that this will finally go in towards the end of 2016. We are participating in the hoped for Portishead and Clevedon (7kms) Gordano Greenway which will serve this village currently cut off by main road traffic. Our 2014 study for this interesting route is now being taken forward by Lancashire County Council. We are working with this local group to deliver a railway path from Peebles to Biggar and Symington and to Tweedsmuir. This will involve over 22kms of new path to avoid the main roads in the area. Planning consent has been granted for the Peebles and Lyne section and work is in hand preparing a submission for the southern section serving the Crook Inn Project. These routes will complete missing sections of a number of Scotland’s Great Paths – The Clyde Walkway, The Annandale Way, and the Ayr Way, all of which currently stop short of meeting up. The Upper Tweed Project will also plug a similar gap in the National Cycling Network, including particularly a Solway to the Forth, coast to coast route from Annan to the Forth Bridge. We anticipate that the popularity of this route will go a long way to supporting the expenditure necessary to complete the Upper Tweed Railway Paths, and to extend the excellent works promoted by the Borders Council in opening up the Peebles and Innerleithen Railway Path this year. John Grimshaw and Associates prepared a number of detailed reports to help a local charity – Peak Cycle Links – to bring forward the key connections from Matlock and Buxton Stations to connect with the popular Monsal and Tissington Trails. Much of this work is being incorporated in Derbyshire’s current Cycling Ambition Programme. These are exciting times for cycling and we look forward to seeing a real increase in numbers cycling. But this will depend upon creating inspiring routes to encourage the public to cycle in the first place, and it is this essential core task which John Grimshaw and Associates will continue to address.